Darkness is looming over the world of SHOWDOWN… and with it come two brand new creatures, and one malevolent hero! 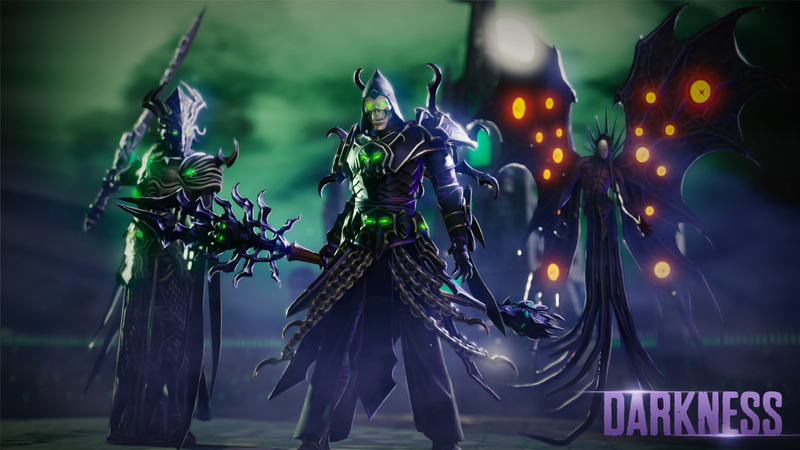 Hailing from the shadowy corners of the Darkness faction, Faceless, Vampire and Sandro, the shadow of death himself, have come to wreak havoc and harvest souls. Along with our vicious newcomers, we’ll be adding in the first of our solo campaigns, following the adventures of everyone’s favourite rampaging Barbarian, Crag Hack! More details about the campaign and the abilities and playstyle of our new hero/creatures will follow soon! This patch will also be our last patch before we come out of Early Access, meaning that there won’t be any updates for an extended period after this one. Don’t be alarmed though! This will allow us to bring you all a greater experience in the long term. As one of Ubisoft’s first real forays into the Early Access environment, we’ve learned a lot, but in our desire to deliver on new modes and features rapidly, we’ve realized there are some elements that require more time and attention than speedy iteration allows. This time between now and the full launch of the game will give us a chance to fully commit to finalizing these plans, and put your feedback to work for the final game. That being said, please do keep giving us your incredible feedback! It’s extremely valuable, and we’re excited to see what the future holds! Your Might & Magic SHOWDOWN team. Well, good luck. I'm not sure if going "undercover" with further development is a good idea though. It seems that things you thought that were going to be fun ("buying" everything, citadel attack mode, primary concentration on PvP instead of PvE) are not so well received by players. Making more decisions like that, just based on your own assumptions may lead to the game crashing down even without a premiere. But maybe now you'll find the time for a testing phase. Anyway, at this point it can only get better anyways :>. So good luck. I really look forward to playing the "released" version and I'm also excited to see the full story mode. The original campaign was quite fun, it reminded me more of a puzzle game than a fighting game (finding a solution for a problem instead of fighting it away or clicking it away). So - more of that please :>. the game is ZERO fun after last update. Bench on strategy game - no comment. First concept was fighting, which was ok. Now you must concentrate on citadel and its shield - no fun and boring. The game is K.O. So is the game running or not? i cant seem to get in. It always gets unresponsive in the press start screen..
Hey folks, just to pop a message in here to address some of the comments below; I can reassure you that we will *not* be abandoning the game. We're committed to providing the best experience possible with SHOWDOWN, which the time between this patch and release will give us the ability to do. @ZogZog: Noted and forwarded to the team! @Dread Baron Beardly: Not right now, nope. With this update we'll be introducing the first of our single player campaigns based around specific heroes. Oh nooo! Please do not abandon this game too! The trauma with the abandonment of Heroes 7 was terrible! Please put possibility to change light in painting mode and looking of citadel. "Please do keep giving us your incredible feedback! It’s extremely valuable, and we’re excited to see what the future holds" Similar words could be heard when H6 was abandoned. Then, several years, even worse situation with H7. Why should I believe it will be different this time? "last patch" is curious news. They really should release a demo for it. So if it is leaving EA does that mean the solo and PvE content is all in ther now?